Goof Off® Rust Stain Remover reacts with the iron in rust stains to neutralize and remove them from almost any surface, painted or bare, indoors or out. Use it wherever you see rust stains on tile, grout, sinks, tubs, toilets, dishwashers, counters and on all your outdoor problem areas too. It even works on tools! No rubbing or scrubbing. Rust stains simply vanish! Easier and less expensive than sealants when painting over rust-stained walls. 1. 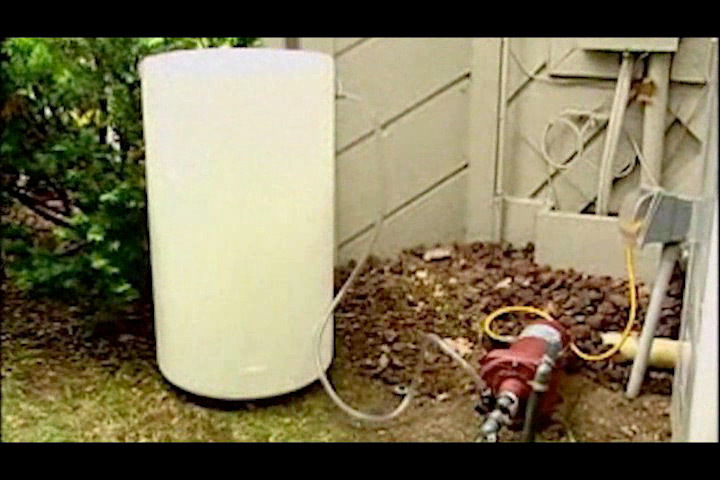 Apply full-strength using a garden sprayer, cloth, roller or sponge. 2. Allow stain to disappear and rinse. Repeat if necessary. Wear eye protection and rubber gloves during use. Every surface is different, so always apply on an inconspicuous area before using. Will etch glass if not rinsed immediately. Spray surrounding plants and grass with water before and after use. Do not apply to any paint, stain or surface containing iron oxide pigments. Let dry and wait for test results before application. DANGER: HARMFUL IF SWALLOWED. MAY CAUSE BURNS WHICH MAY NOT BE IMMEDIATELY APPARENT. Contains Hydrofluoric Acid and Oxalic Acid. Avoid contact with eyes and skin. Use only in a well-ventilated area. Avoid breathing of vapors and mist. Do not ingest. Wear chemical-resistant gloves and eye protection. FIRST AID: For eye contact, flush thoroughly with water for at least 15 minutes, removing any contact lenses, and get immediate medical attention. For skin contact, flush with water for 15 minutes and get medical attention. If swallowed, do not induce vomiting. Drink several glasses of water or milk, and get immediate medical attention. What is Goof Off® Rust Stain Remover? Goof Off® Rust Stain Remover is a biodegradable chemical formulation that removes rust stains on contact. Is Goof Off® Rust Stain Remover safe for plants & grass? Yes. 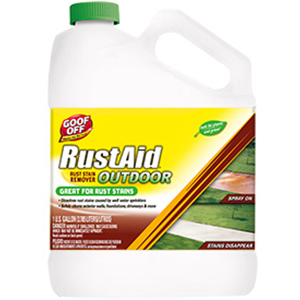 Goof Off® Rust Stain Remover is safe for plants and grass when used as directed. Can I use Goof Off® Rust Stain Remover on my red brick? It's not recommended. Since most red brick is colored with iron oxide, and Goof Off® Rust Stain Remover is designed to dissolve iron oxide, the product is most likely going to turn the brick white. Will Goof Off® Rust Stain Remover remove tannins or water stains? No, it's designed only to remove rust stains. Can Goof Off® Rust Stain Remover damage sealers? It could. If you're not sure if your sidewalk/driveway/siding has a sealer on it, try the Goof Off® Rust Stain Remover in a small, inconspicuous test area to check for compatibility. How do I apply Goof Off® Rust Stain Remover for the best and quickest results? Spray the Goof Off Rust Stain Remover on full strength and don't rinse it off until the rust stains disappear. If the Goof Off Rust Stain Remover starts to dry up, reapply it to keep it damp until the stains dissolve away. I didn't really believe that this would work on removing the heavy rust stains from the vinyl siding on my house, but just a few minutes after spraying it on-the rust stains completely disappeared! Too easy! !